It's been a while since I posted, mainly due to ramped up work and family obligations, but I've not stopped baking. 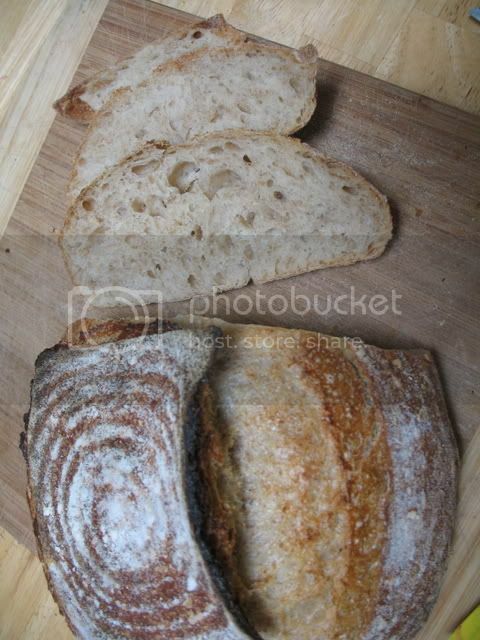 And, despite the fact that both of these breads are white, the vast majority of my baking is still 100% whole grain. But, dangit, white bread -- I just can't quit ya. I was particularly pleased with the poolish demi-baguettes that I made for dinner last night. I had my first acorn squash of the season, and had made a soup with it. 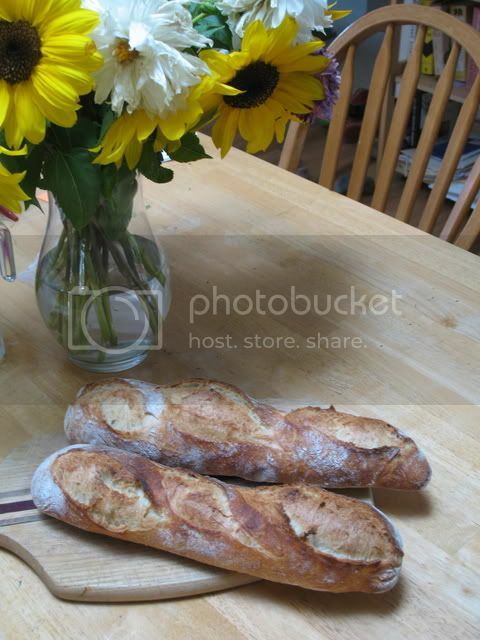 For some reason, poolish baguettes seemed just the right accompaniment. These are, without a doubt, the best looking baguettes I've ever made. Took a lot of less-than-perfect loaves, but I think I now understand how to shape these buggers so they don't look like a string bean with big bulbous ends, how to time them so they still have some room to spring in the oven, and how to slash them so they look like ... well ... a baguette. Today, they were starting to get stale, so I cut the leftover baguette in half and broiled it with some mozzarella, which we ate with a chopped up tomato from the garden. These were about 12 oz each, with 33 percent of the flour in the pre-ferment and a hydration of 66%. I used about 1/16 tsp of yeast in the poolish (135g of water and flour, each) and then about 2g instant yeast in the final dough (270 flour, 135 water, 8g salt). The poolish ripened for about 12 hours, but it's pretty cold in my house -- mid 60s at bestt. 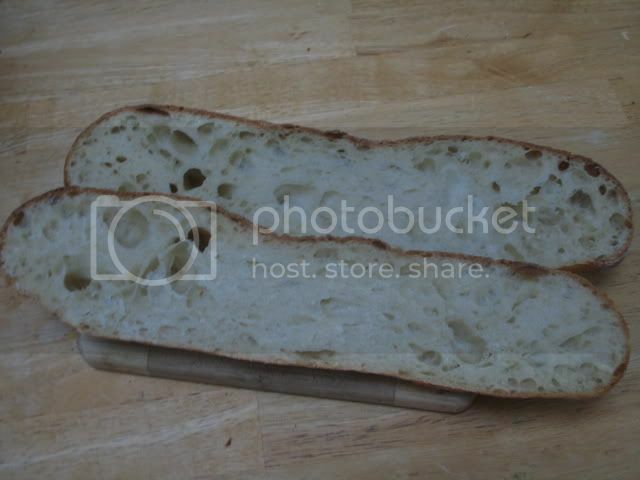 Earlier in the week, I also made a white sourdough (20% of the flour in a thick starter at 60% hydration -- the starter was 100% whole wheat, and the overall hydration was about 75%) which I let retard overnight outside. It was lovely, but the top seemed as if it wanted to peel away. Was probably a little underproofed. Again, I was pleased with the crumb. Hopefully, things have calmed down enough so that I can post a little more frequently. I've missed this community! Good to see you back jmonkey! You have been missed. It looks like there has been an explosion of newcomers to who could learn lots from you, just like I did when I first came here! Hope the family is well. Happy Baking! We missed you, too! Your breads are lovely, of course. Your baking was an inspiration to me when I first joined TFL. I'm looking forward to seeing more of your fine breads once again. 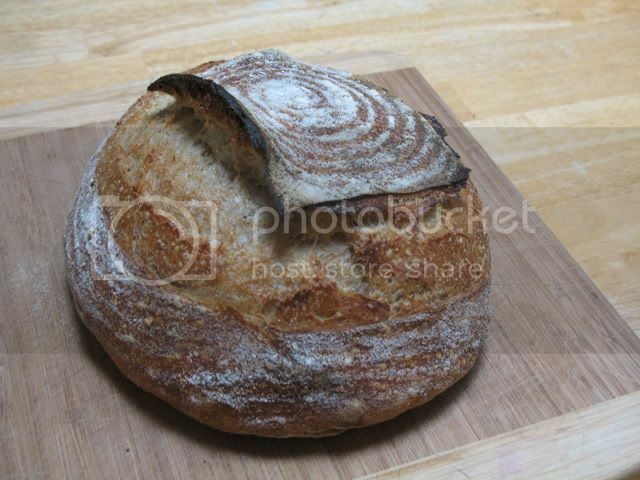 I would be very happy to get the oven spring and bloom you got in that boule. You might have gotten less if you had proofed it longer, but then your crumb might not have been so terrific. The baguettes look great, too. Having been through "the great baguette quest," I learned a lot about the impact of different formulas and techniques, but, when it comes to scoring them, there is no substitute for practice. It's good to be back! And thanks for the kind words. I'm hoping to make some sort of rye bread this week, as I (once again) successfully revived my sorely neglected rye starter. This time, it had long spindly threads growing on top, but, as usual, the interior seemed untouched. Amazingly, it revived. Recent bakes -- I'm back!